Am I a terrible parent for letting my twelve-year-old daughter binge-watch the 90s super sitcom “Friends” over the last few weeks? I’m sure by somebody’s standards I am. But it’s been a particularly cold and rainy late winter and early spring, and I was curious about what she would think about the world I inhabited during my twenties. Over the last few weeks I would ask her about what she thought of the show. She wasn’t much for dialoguing about it, so I’d leave her alone hoping for a more substantial conversation later. I didn’t watch every show with her. She would often come home from school, do her homework and chores and watch an episode or two before I got home from work. But I followed along casually, enjoying the memories of that decade of life. My wife and I got married the year “Friends” started. I remember enjoying the novelty of watching a new show about a bunch of twenty-somethings with my new partner in life. It felt good to have someone to share it with. It was an adventurous decade that took us around the world. We lived in Hawaii for part of that decade. We traveled to eleven different countries and lived in New Zealand for several months. And we had our first child. Our life didn’t resemble that show at all, but in between the travels and moving from place to place, we’d catch up on episodes and follow along with that storyline. We made some of our own best friends during that time period. Real people who we could talk to face to face without the modern distractions that would show up in years after the show ended. One of the things that struck me about the show is the lack of technology evident. Even though the show was born at the same time the Internet was sweeping over the country, you didn’t see references to computers or screens for that matter. You hardly ever see screens. It is face-to-face interractions between six characters, and it reminds you of how people used to engage with one another. I watched my daughter watching it and wondered if it looked old-fashioned or out-of-date, because the world we inhabit today is all about screens. Listening to Chandler’s homophobic and transphobic lines, I’m reminded about how common those thoughts were in the decade before we had gay friends or trangender colleagues. Before we began to understand their lives. “Friends” occupied that time between the screen-free, care-free days of our non-technological childhoods and the age of information. The thing about “Friends” that a lot of cultural critics miss is that it’s not a show about six single friends in New York City. It’s a 286 episode play about six characters who learn the dynamics of friendship through shared experiences, learning about different values, challening each other’s belief systems and constantly communicating face to face through every conceivable situation. New York doesn’t even figure into the sitcom as a place other than the very faded backdrop to the location of their apartments and the coffee shop. 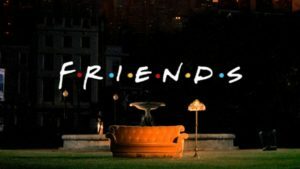 Unlike Seinfeld, where the city plays a major character, Friends focuses on the lives of six people and their interractions in the places they live and the places they hang out. Yes the characters are hopelessly white and middle class. But so was America. It was just waking up to the idea that it could be more than that veneer that television hung on to for so long. Growing up with third-culture friends in a white, evangelical Christian community was its own strange dichotomy, but not that different from missionary kids who grow up in a Missions compound where their worlds are divided between those they work with and those they live with. “Friends” marked the cultural transition between childhood and adulthood much like a person’s third decade does. The friends you make change the way you look at the world. Watching the show on high speed illustrated that fact for me. The lives of each of the characters changed over ten years, because of the interractions and shared experiences they had with new people. Today “Friends” would have brown-skinned characters and people from different religious backgrounds or even social classes. But in 1994, for me, just having friends with different world views was enlightening. It offered a basis for getting along with people around you regardless of the background you came from. I think what struck me most about watching the show with my daughter was the shared laughter. I haven’t heard that kind of laughter in a long time. The jokes hold up. The situational comedy is light-hearted and funny. It was the kind of laughter that existed in a time period before reality set in. “Friends” was one of the last great situational comedies to air before the onslought of reality television. It was network television’s fairwell to a poor and unmotivated Generation X before moving on to the lucrative Baby Boomers. The cynical part of me wanted to be able to bash it, to talk about how much it didn’t hold up, but my sentimental side won out, and I laughed and laughed along with my daughter, who got to peek into the decade before smart phones changed the world forever.